if you are not coming for any reason you have to pay the same ok.
everybody is welcome to my place here ! my house is your house feel geat ! Backpackers Balcones is located 1.5km from town, surrounded by gardens and nature and is next to the fast flowing river “Rio Pastaza”. It is a very friendly hostel with a relaxed atmosphere. 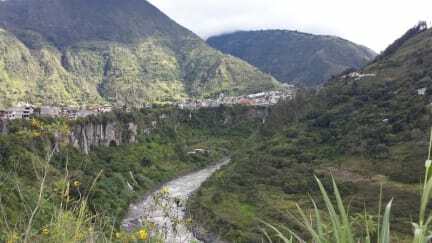 There are sensational views of the mountains and active volcano (Tungurahua) from the balconies, which also provide perfect places to ‘chill out’ in the hammocks. There are a variety of rooms available - for singles, couples, or for families, with either a shared or private bathroom. Some rooms also have private kitchens. There is a fully equipped shared kitchen and dining area on the third floor. A free transfer to the hostel from the Banos bus terminal is available if you give prior notice. There is also free parking at the hostel. Nettes Hostel etwas außerhalb der lauten Innenstadt. Wir hatten ein separates 5-Bett Apartment mit eigener Küche und sensationellem Blick auf den Fluss .. alles in allem sehr empfehlenswert ! This Hostel was great! The atmosphere is super relaxing. I especially liked the large amount of plants and the hammocks. However the host was very unfriendly. We did not get the rooms we reserved, but others, he did not answear to questions and when he drove us to the city-center in his bus (for 5 $) he did not bring us to the restaurant that we wanted, but to a restaurant of his choice, so we had to walk the rest. However I would still recommend this Hostel! 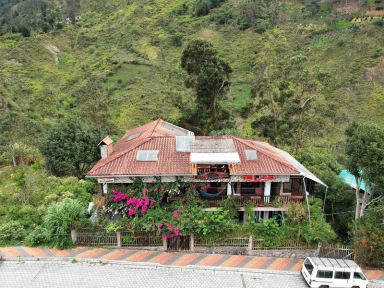 Balcones is a atmospheric old hostel covered in green and flowers, a good 15 minutes from the city center. The owner was mostly helpful, rooms basic but clean and comfy and the kitchen had the most important stuff. The hostal was nice, clean located directly above the river. the rush of the water could be heard everywhere. every floor has a kitchen and at the top there is a terrace. from the city center you have to go a bit further. unfortunately there are many street dogs around the hostal. On the second day we left in the evening from the city center to the hostel. About 200 meters in front of the hostal there were 4 dogs, which woke up and ran towards us and belten loudly. Luckily they did not harm us! The hostel itself is very nice, has lots of green and very nice people volunteering there. Also we liked that it's more relaxed than in the city center. Main problem is the owner, who is really creepy. He was knocking at our door in the middle of the night asking us to pay in advance. His appearence is rather strange and feels unpredictable. We moved to another hostel after that incident. Wouldnt recommend to stay there as a girl travelling solo.